There are perhaps 50 sand artists in the world who may be called Masters, who are capable of literally blowing you away with their work. That’s it. Some say there are fewer than that. Since 2011, 20 of the very best have participated in the U.S. Sand Sculpting Challenge in SAND iego. That’s 40% of the most talented artists in this medium on earth. Wow! Those who participate must be invited by the producers. They must have won at least one other major competition in the world. Many of our sculptors have won many. We invite the best from outside the U.S. to compete against the best in the States. That’s why we call this the U.S. Sand Sculpting Challenge. Last year an American won for the first time since our inaugural. Well, he’s actually a Dutchman who lives in Florida. One year our winner claimed the victory for Latvia, even though he was living in Tacoma, WA. It gets complicated. Maybe we should call this the guess-where-the-sculptors-are-from event. For example, Master Sculptors include a retired Atlantic City, NJ, fire chief who mostly lives in Italy, a Dutch lady who also spends half her time in Italy, a California lady who lives in Eastern Canada half the time. Frankly these folks travel so much that we’re thankful we can reach them via email, rather than sending a poor Pony Express rider out to chase them down. Find more info below on each of the hugely talented sand artists who will be or have visited with us on the beautiful downtown SAND iego waterfront, along with links to learn more about them and see more of their art. It’s totally amazing. Watch this space to see who’ll be here on Labor Day weekend 2019. A 1983 graduate of Musashino Art University in Tokyo, Katsu has become one of the leading sand sculptors in the world. He is also a renowned producer and director of amazing events that have been staged, not only in Japan, but also in Singapore, India, Kuwait, Italy, Holland, Canada and here in the U.S. He has been honored as “One of 100 Japanese individuals the World Respects”. In his home country, he pioneered modern sand sculpting when he founded the Fukiage-hame Sand Festival in 1987, which ran continuously until 2002. Since 2006, he has been Executive Producer of the Tottori Sand Dunes Sand Museum, the only venue of its kind in the world. In 2014 he brought together the world’s leading sculptors to participate in a ground-breaking Tri-National Celebration in Yokohama, featuring historical figures from Japan, South Korea and China. The U.S. 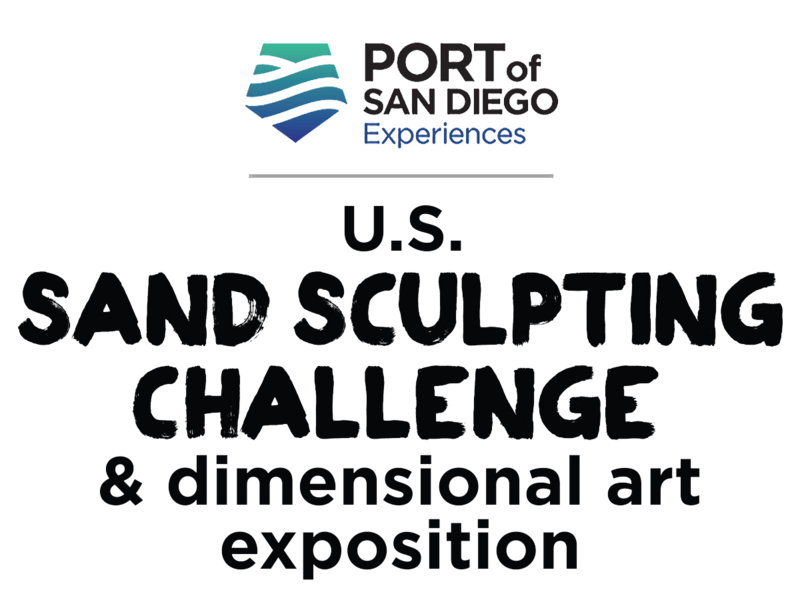 Sand Sculpting Challenge is itself honored to have Katsu come to San Diego to compete against other amazing sculptors worldwide and some of the best sculptors in our country. Michela’s artistic ambition was simple. She wanted to draw. And so she did, studying at the Art Institute in Italy. But it was during a scenery course that she discovered a new direction for her creativity. She worked as a set designer on several productions, creating background paintings and sculptures. Then, in 2003, while at the beach near her home, she began carving sand as a way to visualize her ideas for stage sets. “I used sand sculpting as a way to train myself as an artist,” Michela said. Soon Michela was hooked on the beauty of the medium. And now art lovers throughout the world are hooked on the beauty that Michela creates in sand, as she carves incredible variations of the human form. “There are so many different styles of composition,” she said. “It’s amazing what you can do with only sand and water.” Amazing, indeed. During the 1990s, Dave was one of the planet’s top sand sculptors, winning the U.S. Open in Imperial Beach and a number of other competitions around the world. In 1998, he retired from touring to devote more time to his family and establish Henderson Sculptural Arts, a landscaping construction company specialized in designing, creating and maintaining waterfall and grotto features, ponds and pools for some of San Diego’s most exclusive properties. He came out of his self-imposed sand-art exile in 2011 (if only briefly) to help us with the inaugural edition of the U.S. Sand Sculpting Challenge. The work he created that year (“Sand Castles on My Mind”) has become an icon, as it has appeared in dozens of posters and ads on our behalf. More recently he has agreed to be on our expert panel of judges, a great honor for us and a fantastic learning experience for our younger elite World Masters. Fate works in funny ways. Fergus Mulvany never thought about sand sculpting while studying fine art in Dublin. Even as a child, he was never drawn to playing in the sand at the beach. But Fergus’ name was randomly drawn from those of hundreds of students to participate in a sand festival held in Holland in 1993. And since that fateful event, he has developed a passion for the gritty stuff, competing all over the world. Of course he works in other media as well. During winter, Fergus focuses on snow and ice sculptures and works with more traditional materials such as steel, wood, cement and glass. Regardless of the material, Fergus’s creative philosophy remains the same, “I’m guided by an organic process rather than a strict idea,” he said. And of course, sometimes he’s simply guided by fate. Born in Spain in 1963, Benjamin was attracted to art while still in the cradle. While just a teenager, he performed painting exhibitions in his hometown of San Sebastian. He discovered sand sculpting at 25, and has been a leading figure in this art ever since. In 1997, he participated in the first International Competition in the Canary Islands and took 2nd place. (He has won dozens of awards since then.) In 1998, he began consulting and producing festivals around the globe. He has left his mark in places as diverse as Belgium and Indonesia, Holland and Colombia, Mexico and Qatar, the U.S. and China. In addition to sand sculpting, Sr. Probanza works in stop-motion animation with sand, clay and other materials. He builds miniature models and does macro-photography. He’s into toy design and new technologies. He is certainly one of the most interesting men in the world, and may well be the model for a new Marvel superhero. 2009 – 2nd prize, Vancouver, B.C. Morgan is a born an’ raised California girl. She likes beaches, flowers, avocados, fruit and bare feet. After dropping out of college in 2007, Morgan stumbled into sand sculpting (or it could be said that sand sculpting stumbled into her.) It began an immediate love affair, and though not always career-monogamous, sand sculpting has had her heart through the current day. Like many of her incredibly talented peers, this profession has taken her around the world, in front of television cameras, and deep into the caverns of dream-like circumstance. She considers herself to be quite fortunate and rich in many ways. There have been medals won and articles written; but also many long days, many callouses, and many sunburns to float it all along! As time permits, Morgan also pursues snow and ice sculpting, clothing and costume design/construction, creative writing, kitchen witchery, scrap paper doodling, street theater, global backpacking, martini-infused philosophizing and rocking out on her ukulele. 2014 is the debut for JOOheng Tan at the U.S. Sand Sculpting Challenge and we are immensely proud to have him here. Hailed as Vincent Sand Gogh by the London Daily Mail, JOOheng Tan fell in love with the art of sand sculpting in the late ‘90s. His debut in 2000 saw him attain first prize in the International Sand Sculpting Competition in the Netherlands. As a result of his fueling passion for sand sculpting, JOOheng’s works have been showcased in over 50 cities across more than 20 countries. There are no signs of stopping for this sand sculptor extraordinaire as in front of him lie plenty of prizes in sand sculpting championships around the world.